This film is on the Best of 1997 list. "Good Will Hunting"
"Good Will Hunting" is built on stirring, honest dialogue. It's the kind of movie that revs up the intellectual and emotional appetite by laying bare the reality of what it means to be human. Driven by rich, frank, passionate conversation, this movie makes me want to seek out my smartest friends for an afternoon of waxing philosophical about anything at all. The story of a rebellious blue collar math prodigy with a highly defensive personality, the script was written by co-stars Matt Damon ("The Rainmaker") and Ben Affleck ("Chasing Amy"), and it is a brilliant, insightful screenplay, complimented by the ironic eye of director Gus Van Sant ("To Die For"). Will Hunting (Damon) is a troubled genius who grew up in a succession of orphanages in South Boston, the gritty part of town. A janitor at the Massachusetts Institute of Technology, he is a self-taught connoisseur of history and the arts, and has an insatiable photographic memory. But he is naturally adept at mathematics and drives the school's professors to distraction by anonymously solving inordinately complex computations left overnight on blackboards. Discovered by Professor Lambeau (Stellan Skarsgard, "Breaking the Waves"), an egotistical erudite who attempts to steer him into the world of professional mathematicians, Will isn't interested a big salary or in being the next Einstein. To him this stuff is so easy it would bore him silly to compute for a living. He doesn't know what he wants to do with his life, but he's pretty sure it isn't math. Damon's portrayal of Will Hunting is wonderfully nuanced. Unstable, charming, angry, alert and passively confrontational, Will doesn't see how his genius should give him any advantage in a world where most of what he's found useful he learned on the streets. After one too many arrests for bar and street fights, Will gets out of a jail sentence by agreeing to seek therapy (after citing obscure decisions he memorized from law books fails). An observer of people's nature, he humorously aggravates a quick succession of shrinks until Lambeau hooks him up with Sean McGuire (Robin Williams) an old colleague working at a community college. Williams, who is kept on a tight leash in this straight role, gives an admirably understated performance. A moth-eaten sweater type academic, he too is a little resentful and vulnerable, and bonds with Will by seeing right through him. "All your knowledge is from books," Sean says. "You've never been out of Boston, have you?" Damon and Affleck designed the characters in their story to be transparent to the audience, but not to each other. His best friend (Affleck) accepts him as a working-class sod, but expects him not to waste his god-given talent. He spurns the girl he's fallen for, a Harvard medical student played by Minnie Driver, when he realizes she's become an element of stability in his life. He deliberately pushes peoples' buttons to prove he can live on his terms. 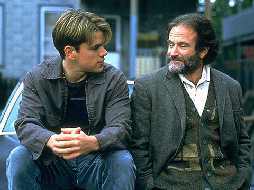 Will's relationships to his shrink, his girlfriend, his mentors and his friends operate on so many levels that watching "Good Will Hunting" is as rich an experience as reading a great novel. Characters in this movie mainly sit around talking -- and it's endlessly fascinating and often funny. As the story converges from several threads into an overall theme of finding one's way in the world, it emulates "The Graduate" ever so slightly (or maybe it's just the Simon and Garfunkel-inspired soundtrack). But there is much more than post-graduation angst at work here. At the core of "Good Will Hunting" is vivid, succulent dialogue that is emotionally naked, yet remarkably pedestrian at the same time. Director Van Sant recognizes this and tailors his trademark sardonic tone to fit the film. While he occasionally employs abstract visuals and creates an acute sense of place by practically turning South Boston into a character itself, he is very subtle about it, letting the immense soul written into the script shine through. "Good Will Hunting" will probably be Miramax's big push film for this Oscar season, and that is a wise choice. It would be a worthy contender for the Best Picture, Best Director, Best Screenplay and Best Actor awards.